Painting a room is one of the easiest jobs to do yourself and anyone on a budget who's redesigning a room shouldn't think twice about tackling redecoration themselves. However, before you find out how to choose the perfect paint colours for your rooms, you need to prepare the surfaces thoroughly, use the right products for the job and work carefully to make sure you get a finish you are proud to look at. This guide covers the lot, from choosing the right paint, to painting skirting and architrave. Looking to paint the exterior? Don't miss our guide to painting a house, from top to bottom. For more decorating advice, tips and guides, see our dedicated hub page. Prep: Cover any furniture with dust sheets and protect the floor. Remove anything hanging on the walls. If you aren't comfortable loosening sockets and switches, protects them with masking tape. Clean and repair: Clean the walls with sugar soap and fill any gaps or cracks in walls and woodwork. Once dry, sand walls and woodwork and give all surfaces a thorough wipe down. Prime: Prime fresh plaster with a watered-down solution of emulsion (70/30 paint to water unless the tin states otherwise). If you are going from a very dark colour to a very light one, you might want to prime walls with a mist coat or two of basic white paint. Ceiling: Paint the ceiling first. If paint drips onto the walls it can easily be covered up. Walls: Paint the walls. In most cases you will need to do at least two coats. Trim, skirting and door frames: Paint any woodwork and architrave. It may need priming first. Clean up: Clean brushes and rollers straight away before paint sets. 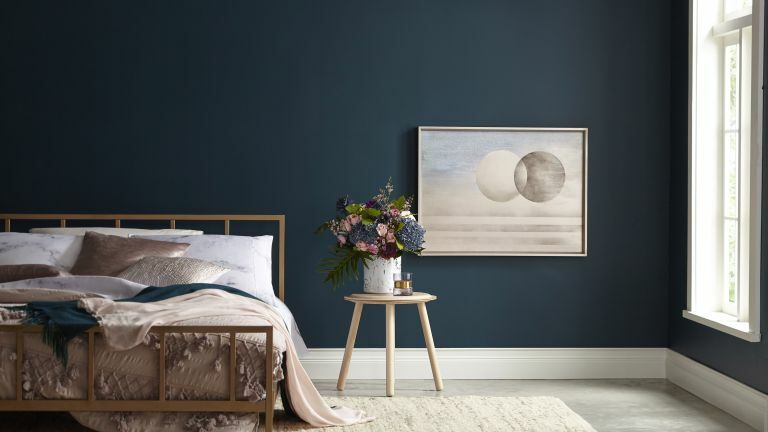 Choosing the right paint colour will come down to preference, but what you may not have considered in much detail is the number of finishes paint can come in. As a rule, you will use matt, flat matt or silk emulsion on walls and eggshell, satin or gloss for woodwork. The paint you use to paint your walls is emulsion paint. This is water-based but may have vinyl or acrylic resin added for durability. This can affect the breathability of a wall, so if this is important (for example if you live in a very old property with potential damp problems) choose a claypaint that allows the walls to breathe and water vapour to escape. Many claypaint manufacturers now offer special hard-wearing, wipeable options that can be used in kitchens and bathrooms. Matt and flat matt: As the name suggests, these offer a matt finish with no shine. It is the perfect choice for disguising imperfections in the wall's surface and offers a very uniform finish for colour. Silk: Silk emulsion creates a mid-sheen finish that reflects some light for a polished look. It can be wiped down easily making it a good finish for high-traffic areas such as hallways and the stairs. How much paint do you need for a room? Measure your room prior to going to buy paint. Multiply the height of each wall by the width to work out the area. Subtract the area of any openings like windows, but remember that you will want a little extra for wastage. Paint tins tell you the coverage of the contents. Each litre of paint will cover approximately 10m2. Remove as much furniture as you can from the room. What cannot be removed should be pushed to the centre of the room and covered with dust sheets. Put dust sheets down to protect your flooring. Tape these to the skirting boards to prevent movement while you work. Sand all surfaces. This will remove any imperfections and help the new coat of paint have something to key on to. Fill any cracks or wholes with filler and sand these areas again once dry. Wash all surfaces with sugar soap and rinse thoroughly with water. Allow to dry completely before painting. Put masking tape along the skirting boards and any trim. You will also want to cover light switches or sockets and windows. If the walls need priming then do this and leave to dry for at least two hours. Fresh plaster needs priming with a mist coat because standard emulsion is too thick to adhere to the surface properly. When you water down the paint, the water is absorbed into the surface which allows the paint to bond. You are now ready to paint the ceiling (use our guide for full instructions). Fill a roller tray (do not put too much in as it will be awkward to move around) and pick a corner to start in. Never overload your paint brush or roller. This will lead to drips or a bobbly paint texture. If you do get too much paint on the roller, keep rolling to spread it out evenly. Cut in around the edges of the ceiling using a narrow paint brush(see how in the video below). If you are going to use a roller on an extendable pole, make sure you paint a wide edge around the ceiling as it can be difficult to neatly roll close to the walls. Alternatively, use a sturdy stepladder to give you good access to the ceiling. Keep moving it so you are where you need to be instead of stretching to reach. Allow the paint to dry before adding a second coat. Once the paint is completely dry, masking tape the edges of the ceiling so that you can paint neatly to the top of the wall. Cutting in is just the process of using a brush to paint the and corners of walls for a really neat finish. You can then fill in the majority of the wall with a roller. If you are right handed, you will want to start in the top left corner of a wall and work to the right. If you are left handed, go in the opposite direction. This means you avoid brushing against the painted wall. Cut in, then fill in the rest of the wall using a roller. For the best coverage, roll in a V-shape then infill. Rollers have different naps/piles and come in different materials. A shorter pile or foam roller is perfect for smooth, new plaster. You may need a longer pile for a more textured wall and if you are painting woodchip or an artexed surface, you will definitely need long pile to get into all of the crevices. A thin radiator roller with a long handle is really useful for getting behind the radiator and other narrow spaces. Find the right roller or roller set in our buying guide of the best paint rollers. As with emulsion, different wood paints have different levels of sheen. Eggshell: This type of paint has the lowest sheen and reflects the least light. Satin: Satin paint offers a mid-sheen that cleans easily. Gloss: For a high-shine, use gloss paint. It wipes down very well, but some prefer the subtler finish of eggshell or satin. Makeover your woodwork with our pick of the best paints for wood. Wait until the walls are completely dry before painting the skirting and woodwork. You will want to protect your wall with masking tape and if not dry, the new paint could be pulled off. You should have sanded the woodwork before painting the room. If not, do it very carefully to avoid damaging the walls. If you are painting woodwork that was painted with oil-based paint and you are now using water-based you will need to look for an undercoat paint that allows the new paint to key to the surface. Fresh wood will also need priming or paint will just soak in to the surface. Ask your local DIY store for help finding the right products for the job. Apply the first coat. Be careful not to overload the brush as it will drip. If you do get drip marks, sand out once the paint is dry and apply another coat. Unless you are using one-coat wood paint, you will need another coat for a good finish.